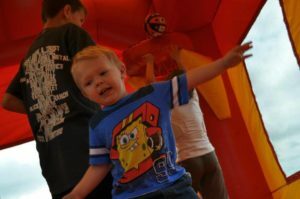 A summertime party would not be complete without a bounce house. A large inflatable in the yard guarantees a good time with lots of fun and active amusement. Get some exciting suggestions for enjoyable games to play at your next outdoor party. Move this standard playground game into the confines of an inflatable for even more fun. You will need four teams for optimal play. Divide children up evenly into four groups, and give each group a specific color. Affix a sticker of each color into a corner of the inflatable and give each team a designated team flag. Every team member also needs to wear a fabric streamer in the team’s color. The object of the game is for kids to try to grab the fabric streamers and flags of the opposing teams. When a streamer is captured, the child who lost the streamer leaves the inflatable. A team wins by capturing the most streamers and flags. Play music while kids play in the inflatable. As long as the tunes play, the children can jump. Whenever the music stops, everyone needs to freeze. Anyone who doesn’t freeze gets eliminated from the game. When the music resumes, the jumping begins again. Keep starting and stopping the music until only one player remains. The old game of “Red Light, Green Light” comes alive with renewed energy when kids play it in an inflatable. Upon shouting “red light,” everyone bouncing must freeze. After someone shouts “green light,” the jumping frenzy can resume. The person directing the jumping can also give additional instructions such as having the children bounce like frogs, kangaroos, or even have them pretend to be popcorn! 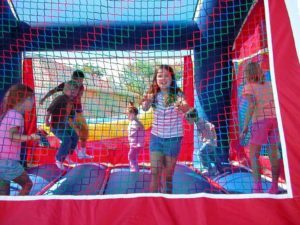 Get creative with your next bounce house party to give your guests a joyous time!